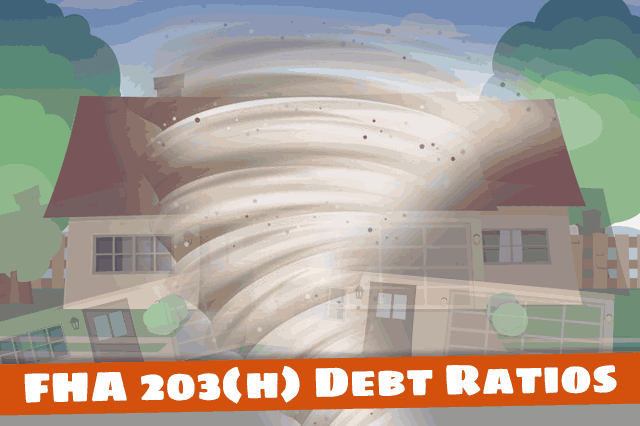 FHA 203(h) disaster relief loans have similar qualification requirements as standard FHA purchase or refinance loans, but offer more lenient credit and down payment requirements due to the circumstances surrounding the loan application. July 20, 2018 - FHA 203(h) loans are intended to help those recovering from natural disasters in FEMA-declared zones known as Presidentially-Declared Major Disaster Area or PDMDAs. These disaster relief mortgages have some similar requirements to qualify as “standard” FHA purchase or refinance mortgages, but the 203(h) offers more lenient credit and down payment requirements due to the circumstances surrounding the loan application. For example, there is no FHA-mandated down payment requirement for a 203(h) mortgage. FICO scores for this type of loan can be as low as 500 according to HUD 4000.1. Lender standards and other requirements may also apply. apply any property insurance proceeds to the Mortgage of the damaged house. For typical FHA home loans, late or missed mortgage payments in the 12 months leading up to the new mortgage application can be extremely problematic. However, FHA 203(h) mortgages recognize the unusual circumstances of this type of mortgage application and certain exceptions can be made for late/missed payments that would otherwise hinder a typical mortgage. This section of the FHA home loan rules also mentions that the lender is permitted to approve the 203(h) loan in cases where the original loan was delinquent by three or more months if the lender determines there are qualifying extenuating circumstances. In all of these rules, lender standards and other non-FHA requirements may apply.